Morris 2x2 standard LED flat panel light fixture with 4000K color is an office light fixture you may be familiar with but more energy efficient than ever. It's LED array will provide long life and general lighting for many years to come. Designed for installation in conventional suspended ceilings for new construction or retrofit projects. This ultra thin LED troffer will provide long life and general lighting for many years to come without replacing bulbs. Designed for installation in conventional suspended ceilings for new construction or retrofit projects. Featuring superior, evenly dispersed lighting that sets the standard in performance for solid state ceiling luminaires. It even has a 0-10 volt dimming onboard standard for many types of electronic dimmers and lighting systems. This is typically used for commercial lighting situations where you want to get maximum energy efficiency and still maintaining light levels throughout the space. There are many choices today in LED, but few meet all the criteria including a very low profile when placed in the ceiling lighting situation. These fit into standard drop ceiling grids that most offices have today, but they can be used in a suspended lighting situation for those of you who want that particular look. Flat panel fixtures have a great look because of the evenness of the light across the face of the light fixture itself. You also get a really good light distribution in all directions contributing to the even lighting you can get in an office space. - 4000K soft white light color. - 110 lumens per watt. - Replaces 70 watts fluorescent. - Fits in standard drop ceiling grid. At BuyLightFixtures.com, we carry high-quality 2x2 panel light fixtures for all types of office lighting applications; anywhere there is a drop ceiling. 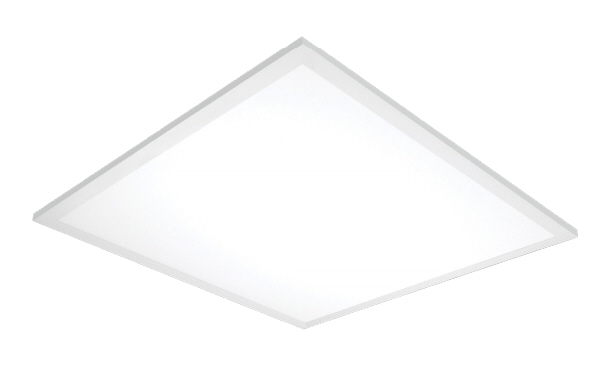 These have a shallow profile and are considered an ultra-thin LED that can fit in almost any ceiling. Unlike regular prismatic lensed light fixtures, these have a white face, and the LEDs are spread evenly across the light fixture. This will give you a very even distribution of light across the fixture and an excellent spread for anything that you might be using it for. Most people use this for offices but also in many other types of applications, even something where it is suspension mounted. Almost all of these come with a dimmable LED compatibility which you can use with LED dimmers and get a low light output if you choose. This is ideal for different types of conference rooms or multimedia spaces where you need to have dimmed to bring the light levels down so everything can be seen well. These are all commercial grade products in their made to exacting standards unlike some of the cheap imports you may see at a big box store. There is a good track record with these, and it has excellent warranties to protect you from any early failure. These days when everybody’s talking about saving energy and therefore money, lighting is considered a way to get this done. That’s when a straightforward but effective light can be an excellent way to accomplish this. A 2x2 panel light distributes the light evenly and is very good for office spaces where you may have a lot of cubicles, and you’re trying to eliminate shadows as much as possible. If you’re curious as to how much you can save in energy costs, you can always download our free energy-saving calculation spreadsheet which is on the left-hand column of our website. It gives you everything you need to make a reasonable estimation as to how much you can save by going to something like this 2x2 LED panel light. Just input all the current data of what you may have now which is most likely some fluorescent, then put the information such as your killer cost and how much it will cost you per fixture to switch over. It will do all the calculations for you figuring how much you’ll save, how fast the payback will be an even maintenance saving. The payback is that period in which you can recoup your investment in the new lighting. Saving energy is important because it hits the bottom line of any business or household. It’s an easy way to get this accomplished with beautiful light. And let’s talk about proper lighting. We often say if you save all the energy in the world, but your lighting looks terrible, then you haven’t saved anything. When it comes to something like a commercial building or an office space, making a wrong decision about lighting can have repercussions in things like productivity and possible errors in everyday work. If you’re concerned about the productivity of employees or tenants, then it’s best to make sure that you’re going to have the proper amount of lighting. A lot of people ask us how many light fixtures they might need. Good news is that we can run a layout for you that can determine exactly how many lights you’ll need and the predictive amount of footcandles that you’ll get as a result. All that we need is some specifics about any of the rooms or spaces that you’ll be lighting, what’s going to be in that area and things like the color as well. From these things we can make a close estimation as to how many of these light fixtures you’ll need. One of the things we take pride in is the higher-quality that these light fixtures offer. These are commercial grade lighting products so they’re not going to be like some of the cheap retail LED ceiling lights that you may see in some of the big box stores. Often they import some of the cheapest stuff from China because it’s all based on price without a thought to any quality standard. Unfortunately, there are a lot of LED light fixtures that people end up replacing them long before their useful life. So that has a cost and the hassle of having to return something this just really cheaply made. That’s why we carry many USA made products and if something is imported it’s from a trusted manufacturer that we know has excellent quality and can stand behind the product. One of the most critical parts of any type of LED lights are the LEDs themselves and of course the driver. The driver is probably the most vulnerable part of an LED light fixture because it’s more susceptible to heat over time. That’s why you’ll see all those light fixtures that have massive cooling fins to keep that whole area cool by dissipating heat. If that doesn’t happen, early failure does. So these are things we keep in mind when supplying you the best possible products that have a track record that you can rely on for long-term performance. Many of our customers will enjoy how easy to install these lights are. They have such a low profile, so it’s not hard to get them in place and then make the electrical connection. Electricians love them for the simplicity and how easy they are to get into any drop ceiling grid. Another thing people like is the low-profile, that is they don’t take up much space above the ceiling. And if you’ve got an office that has some ductwork going along a particular area and there isn’t much room for a light fixture, this often can accomplish this because it is so thin. By doing that you don’t destroy the continuity of the lighting layout throughout the whole space. It’s always been a problem with things that are up above the ceiling because the plenum space is used for many different types of wiring, ducts and any number of communications cable. So the less you intrude into that space, the more room you have for things other than just lighting. Because this is a commercial lighting fixture, it can be used for any kind of lighting specification that you may have. And of course, it can be used in a home lighting situation as well, it doesn’t matter. But it is a higher-quality light fixture then you may have seen in the past. If you’re an electrical contractor or a builder of some kind and you need larger quantity pricing, we can help you with that. We always want to make sure that were not only providing the best quality fixtures possible, but we always want to be competitive as well. We can get you the light fixtures you need quickly and we can get them delivered to your location with no damage. A lot of times were able to get products like this faster than distribution that uses major-label brands of light fixtures. This is one of the ways we're able to better serve you if you’ve got a tight project. We're always looking to try to streamline our process so that you get your lights quicker and with fewer problems. So make sure to call or email us if you have any questions about any of these LED panel lights and we can answer that for you. These are a great new way to get a beautiful looking, clean light in your office or commercial building. There’s never been a better time to look at saving energy because in doing that you can also get a nice lighting upgrade with something that probably looks better than what you have now.